The California Statement and Designation by Foreign Insurer Corporation | Form S&DC-INS must be filled out and filed when an out of state insurer wishes to conduct business as an interstate insurer by providing this service in the State of California. 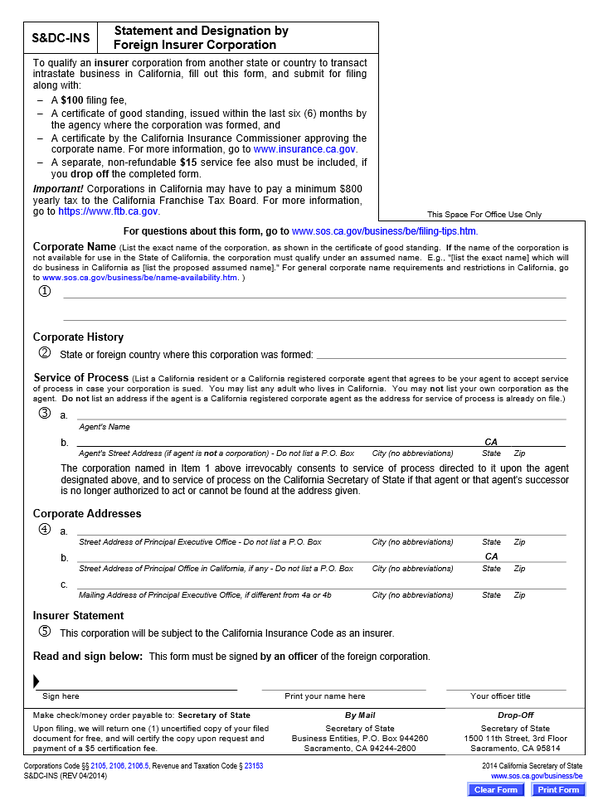 This must be filed with the California Secretary of State along with a Certificate of Good Standing from the state of origin (dated within six months of the filing date), a Certificate from the California Insurance Commissioner approving the corporate name, any and all additional required paperwork, and full payment of all appropriate fees. Depending upon the nature of the insurance corporation being formed other entities will need their own requirements fulfilled (i.e. I.R.S.). It is highly recommended that Incorporators who are unfamiliar with any step of the process consult an attorney before forming such a corporation in this state. You may file this California statement by mail or in person with the California Secretary of State. If submitting by mail send all the original completed statement and all required documentation with full payment for all required fees to Secretary of State Business Entities, P.O. Box 944260 Sacramento, CA 94244-2600. If submitting in person bring all documentation and the California Statement to Secretary of State 1500 11th Street, 3rd Floor Sacramento, CA 95814. Step 1 - In Item 1, report the name of the insurance company as it appears on the Certificate of Good Standing. 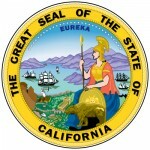 In some cases, the corporation name may not be available or compliant in the State of California. If so this must be rectified by using a fictitious name for the foreign insurance corporation. If so, report the fictitious name as well. Fore example, “(Corporation name) will be operating as (Fictitious name) in the State of California. Step 2 - Report the state/country of origin where this corporation was first formed in Item 2. Step 3 - The third item, “Service of Process,” requires the full name of the registered corporate agent who shall may receive court documents that must be served to the foreign insurance corporation on behalf of the foreign insurance corporation to be entered on the first line. On the second line, Item 3b, report the address of this entity. Note: If this corporate agent has been named as a corporate agent for any entity in the past, do not fill in Item 3b as this information will already be on file. Step 4 - In the “Corporate Addresses” section, enter the Street Address of the Principal Executive Office in item 4a. Next, in Item 4b, enter the Street Address of the Principal Office for the California location. If there is a Principal Executive Office that has not been listed in the previous two items, report the full address in Item 4c. Step 5 - Item 5 will bind the foreign insurance corporation to the California Insurance Code. Step 6 - A corporate Officer must sign his/her name, print his/her name, then report his/her official title at the bottom of this document.